Julie Crook and I visited a magnolia in her landscape on Tuesday that is infested with Magnolia Scale (Neolecanium cornuparvum). We had intended to evaluate a soft scale control method using dish scrubbers to physically remove the scales. I learned about this scale suppression technique from Dan Potter (University of Kentucky Entomology). However, the scales were not as far along in their development as we had expected. The winged males had not yet emerged from their elongated coverings and the females remained flattened. We had planned to target the females once they had "puffed-up." We also discovered hundreds of lady beetle larvae swarming over the scale-encrusted branches to feast on the scale-bounty. The beetle larvae were covered in woolly, white, waxy material; the embodiment of wolves in sheep's clothing. There are a number of lady beetles (family Coccinellidae) in several different genera that produce larvae with glands lining their sides that exude strands of white, waxy material. Studies have shown their wool coats protect them from other predators intent on making these meat eaters meat items. One of the best known lady beetles with wool-coated larvae is the Australian Mealybug Destroyer (Cryptolaemus montrouzieri). Their larvae strongly resemble mealybugs; the epitome of "you are what you eat." You can separate predator from prey by giving the insect in question a gentle nudge. Lady beetle larvae will usually move away quickly. Mealybugs will remain motionless or move away slowly; you can pretend they make bleating sounds. "It’s like déjà vu all over again." Mealybug destroyers were brought to the U.S. from the Land Down Under. Perhaps by men at work traveling in a fried-out Kombie. The destroyers are very effective predators of soft-bodied insects including soft scales: can't you hear, can't you hear the thunder; you better run, you better take cover. If you're too young to get my homage to Men at Work; there's Google. However, we spotted a mating pair of adult lady beetles allowing me to identify the predators in question as Sigil Lady Beetles (Hyperaspis spp.). These small, round beetles sport markings of various shapes and colors overlaid on a black background. This is the second largest coccinellid genus with 94 species found in North America north of Mexico. "I really didn't say everything I said. [...] Then again, I might have said 'em, but you never know." Some species, such as H. conviva, H. signata, and H. binotata, have two red spots making them look almost identical to the Twicestabbed Lady Beetle (Chilocorus stigma). In fact, I believe Hyperaspis lady beetles may be responsible for the mistaken belief that twicestabbed lady beetle larvae are covered in white, flocculent material. They are covered in small spikes. Of course, I will deny that I ever spread that misconception. Julie and I also spotted a few other scale-eating lady beetles including the Multicolored Asian Lady Beetle (Harmonia axyridis). Consequently, we decided to postpone our scale-scrubbing experiment to observe the impact these and other predators will have on the magnolia scale population. 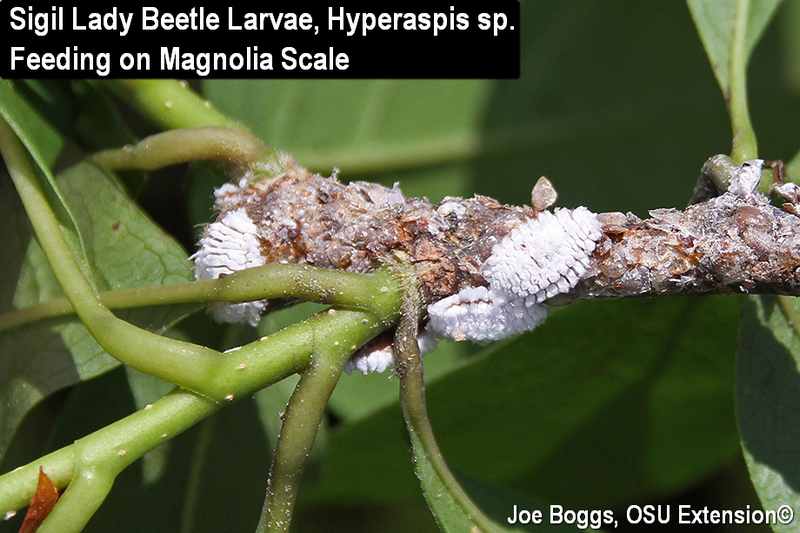 While it may take time, natural enemies have the ability to significantly reduce damaging magnolia scale infestations.